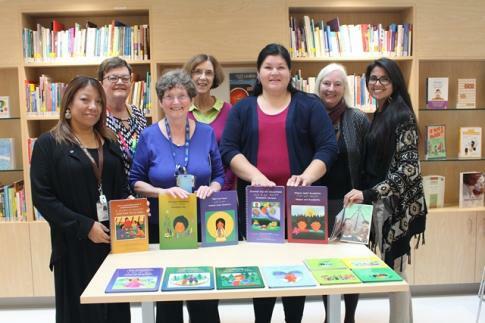 Cree parents and children staying at the Montreal Children’s Hospital (MCH) will be able to read books in Cree thanks to a donation by Child and Family Services of the Cree Nation Government, a donation facilitated by the Cree Health Board. The children’s books, with titles like "Mihkunisk, Taanite E Ihtaayin?" (Red Goose, Where Are You?) are written by Cree childcare workers, edited by Kevin Brousseau and illustrated by Abenaki-Wyendot artist Christine Sioui-Wawanoloath. The stories are told in Eastern James Bay Cree syllabics, Cree roman spelling, and English, making them an excellent tool for language learning. The donation came about thanks to a decades long friendship between, Dr. Elizabeth Robinson from the Cree Health Board, and Dr. Patricia Riley, who recently retired from the Children’s. They first met in the early 70’s as medical students at McGill University. Dr. Riley is now volunteering with "Books for Babies," a program in the Neonatal Intensive Care Unit (NICU) at the MCH that encourages parents to read to their hospitalized babies. Books for Babies offered books in 29 languages but none in Cree whichprompted Dr. Riley to reach out to her old friend Dr. Robinson at the Cree Health Board.Dr. Robinson got in touch with Melissa Rodgers, Pedagogical Advisor for CFS, who loaded boxes of books into her car and drove 780 km from Mistissini to deliver them in Montreal. 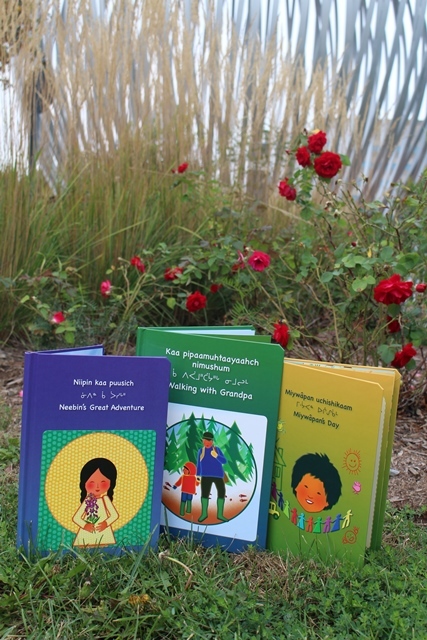 It was in recognition of the importance of reading and Cree language learning that Child and Family Services initiated the project to develop the book series. There are now 15 books in both Inland and Coastal dialects of Eastern James Bay Cree. Studies show that reading to a baby helps the him or her learn and improves memory. For parents of premature and fragile infants in the NICU, reading is a way that they can connect with their infant. Cree babies in the NICU need to hear their language and the voices of their family members, but sometimes it is hard for parents to break the silence. ‘I started to read and then the words came,’ is what one parent said about how the program helped her to bond with her newborn through the walls of the incubator. Jan Lafrenière, founder and coordinator of "Lire-Imagine-Read" program at the MCH, conducted research showing that parents who read to their babies are more likely to keep the habit of reading to their children later on. This can help children develop a lifelong love of books and reading. The books will be available to all Cree patients at the Glen site in the National Bank Family Resource Centre and Library, down the hall from the gift shop on the ground floor of the Glen. MCH Family Resource Centre of the Montreal Children’s Hospital (MCH) the pediatric hospital of the McGill University Health Centre (MUHC).